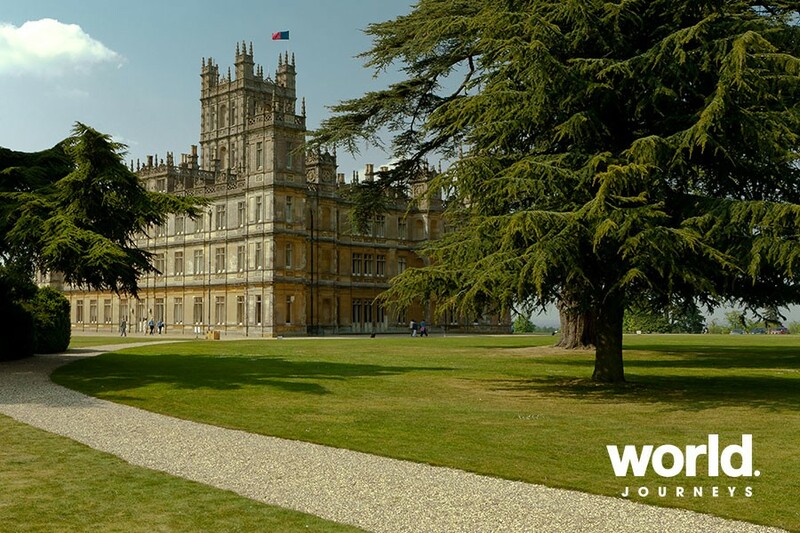 On selected departures this season* on hotel barge Magna Carta's classic cruises, an excursion to Highclere Castle is included, setting for the renowned period drama series, 'Downton Abbey'. The hugely impressive Victorian castle sits on an expansive 1,000 acre estate surrounded by gardens and is the iconic home to the fictional Crawley family on the show. The 'real' Downton Abbey has been owned by the Carnarvon family since 1679, where Lord and Lady Carnarvon still live today. Actually, it is just one of many memorable tours in the Magna Carta itinerary. There is Cliveden, a magnificent mansion once owned by the Astor family and the scene of much political intrigue and scandal in the 1960's, as well as Hampton Court Palace, the magnificent Tudor home of Cardinal Wolsey and then Henry VIII which was a Royal residence until Victorian times. And, of course, on every cruise along the Royal River Thames, our guests will also enjoy gourmet cuisine, fine wines and impeccable service from an attentive crew, offering a taste of the grace and elegance that is 'fit for royalty'. The 8 passenger Magna Carta is one of the finest, most luxurious vessels cruising the British Isles. 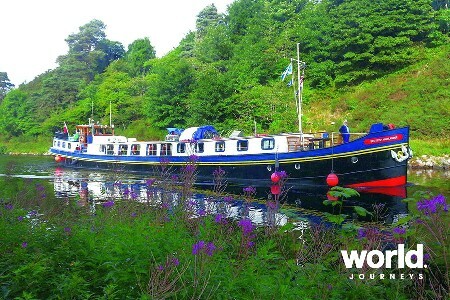 The ambiance created by combining a traditional barge hull (1936) and fine mahogany, teak and oak woods is outstanding. 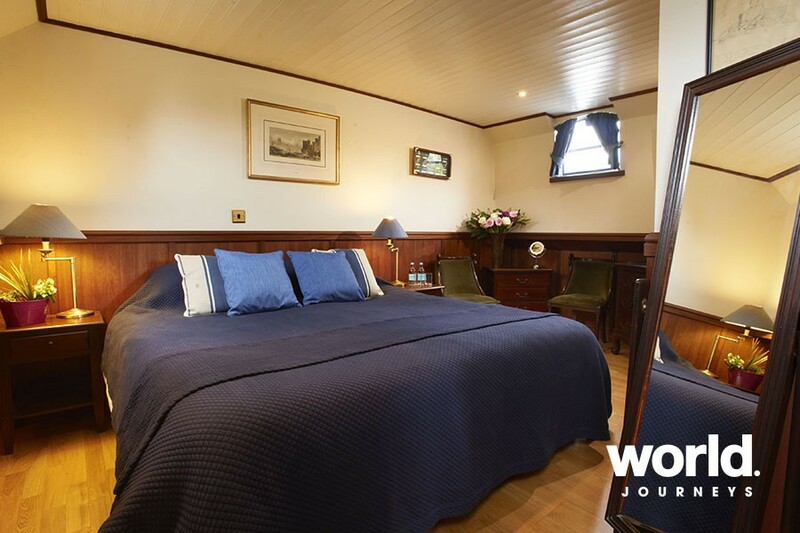 The upper deck saloon and dining areas sport picture windows and stylish furnishings and the sun deck has comfortable seating and a spa pool. Magna Carta has the most sophisticated modern amenities, including air conditioning, WIFI internet access and underfloor heating in each of the four full width suites. Each suite has exceptionally spacious contemporary en-suite facilities, TVs and DVD players. There are eight bikes on board to take at your pleasure for rides along the tow paths. Her experienced Captain knows the Thames well and will pilot the barge and be your tour guide. Your Master Chef will produce a range of mouth watering dishes whilst you enjoy the sights of London and the home counties from your floating country inn. Two house keepers complete the crew of four. Day 1: London > Hampton Court Guests are met at the designated meeting point in London for afternoon English Cream Tea at 3pm, before being transferred to the Magna Carta moored alongside Hampton Court. Champagne reception and welcome by the Captain and crew. Dinner on board. Day 2 Hampton Court Palace > Runnymede This morning we have ample time to explore Hampton Court Palace, the magnificent Tudor home of Cardinal Wolsey and then Henry VIII and used as a Royal residence until Victorian times. We walk through Henry's great hall, the enormous kitchens and haunted gallery and see his chapel, still used for worship today and with the finest Tudor ceiling in existence. Outside, the gardens are stunning, with features such as The Great Vine, the oldest in the country still producing grapes and the famous maze. 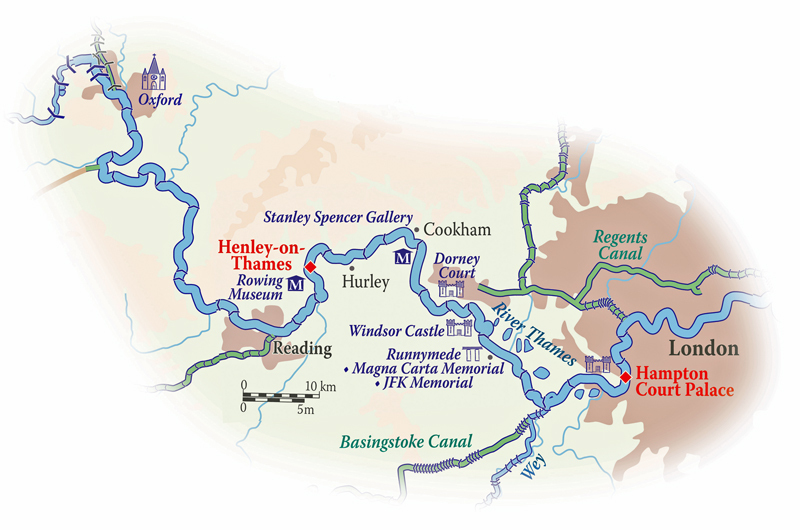 After lunch, we enjoy our first cruise on the Royal River Thames through several locks and follow the meandering course upstream to our overnight mooring near Runnymede. Dinner on board. Day 3 Runnymede > Windsor After breakfast, we have the option to use the spa facilities of the newly refurbished Runnymede-on-Thames hotel including pool, sauna and steam room. Beauty therapies, massages and other treatments are available but are best booked in advance. 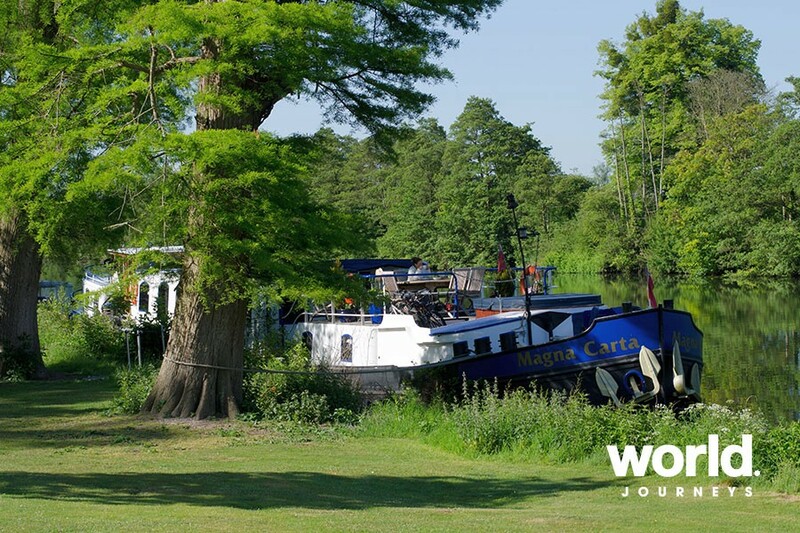 This morning we cruise to our mooring right in the heart of Windsor, passing the meadows of Runnymede, the Magna Carta Memorial and Magna Carta Island. Here in 1215 King John faced the barons and was forced to put his seal on the document which became the very first Bill of Rights and from which our vessel takes its name. After lunch on board, our excursion is to Windsor Castle. 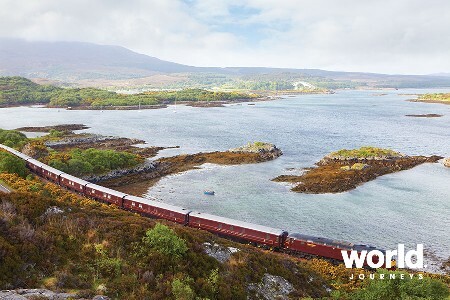 Built by William the Conqueror in 1066 and lived in for over 900 years by the Royal Family, this is the largest inhabited castle in the world. We explore the State Apartments and St George's Chapel, see Queen Mary's Dolls House and enjoy the far-reaching views from the castle's elevated fortress position. Dinner on board. 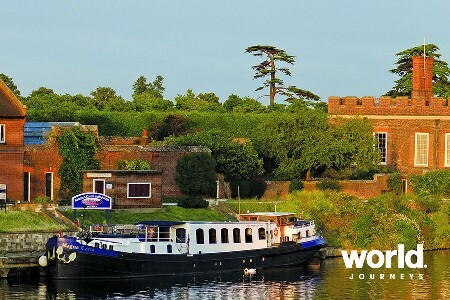 Day 4 Windsor to Cookham This morning we cruise through upstream past the fabulous waterside homes of Bray and Maidenhead, through Boulters Lock (made famous in Victorian times) and into the spectacular Cliveden Reach where we have special permission to moor at the house itself. 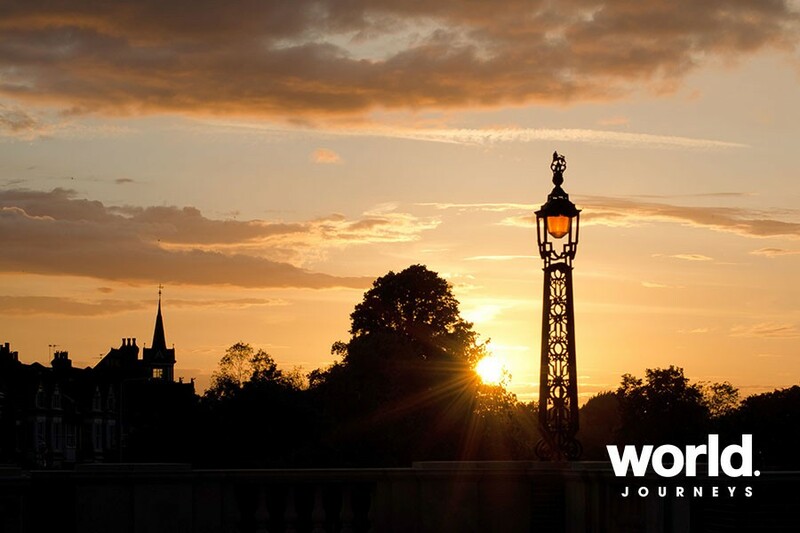 Cliveden was once owned by the Astor family, though the original house dates back to 1666. The property has glorious gardens that include a Parterre, Chinese water garden and wonderful topiary and was, of course, the scene of much political intrique and scandal. A late afternoon cruise takes us to a stunning mooring at Cookham Lock. Artist Sir Stanley Spencer, one of England's greatest and most eccentric painters, once described Cookham as 'Heaven on Earth' and much of his work was painted in and around Cookham. Dinner on board. Day 5 Cookham > Hurley After breakfast we are driven to Highclere Castle (Downton Abbey), one of England's most beautiful Victorian castles set amidst 1,000 acres of spectacular parkland. The Carnarvon family has lived at Highclere since 1679, and the current castle stands on the site of an earlier house, which in turn was built on the foundations of the medieval palace owned by the Bishops of Winchester for some 800 years. A longstanding friend of the Carnarvon family, Julian Fellowes had Highclere Castle in mind as he wrote 'Downton Abbey'. He often commented he wanted a house which spectacularly testified to the confidence and soaring optimism of the Edwardian period. After lunch we visit the Stanley Spencer Gallery in Cookham which celebrates the paintings of one of England's greatest and most eccentric artists. 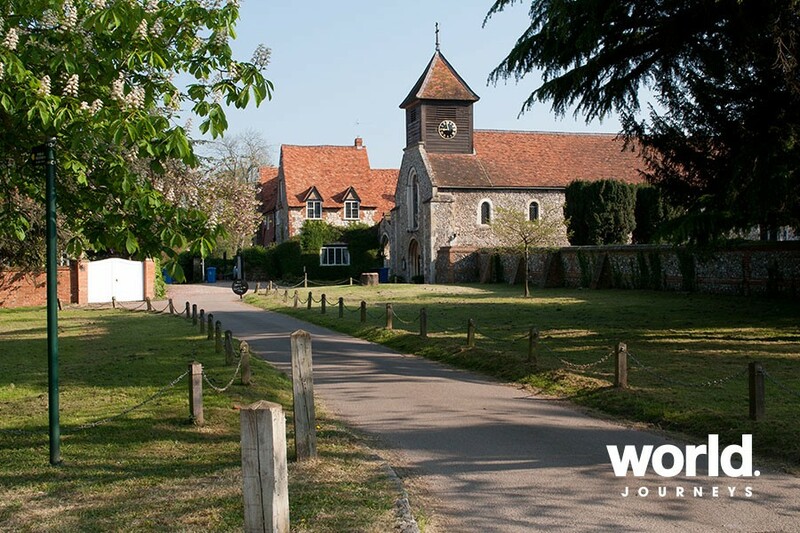 We also take a walk around the village he once described as 'Heaven on Earth' and where he painted much of his work, before cruising through Bourne End and Marlow to the medieval village of Hurley. Dinner on board. 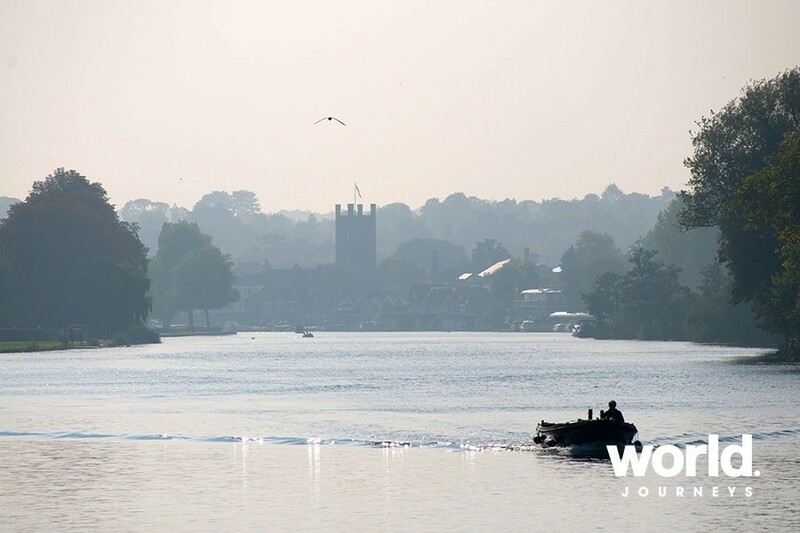 Day 6 Hurley > Henley-on-Thames & Oxford This morning we tour Peter Freebody's boatyard nearby and watch the traditional craftsmen at work, building and restoring classic wooden craft as they have done for generations. 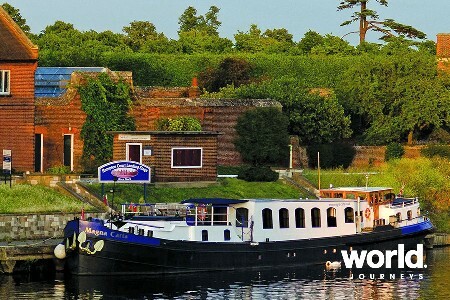 We have time to explore the ancient village, including one of the oldest inns in the country, Ye Olde Belle, before returning to the barge and cruising through glorious countryside to our final mooring situated along the famous Henley Regatta Rowing Course. After an earlier lunch we drive to Oxford for a fascinating tour of Christ Church, Oxford's grandest college, founded by Cardinal Wolsey and then again by King Henry VIII. The magnificent surroundings were also where Lewis Carroll wrote Alice in Wonderland. Captain's Farewell Dinner on board. Day 7 Henley-on-Thames > London After breakfast, disembark Magna Carta and transfer to the designated drop off point in London. 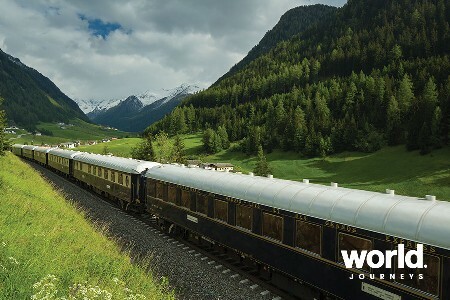 The Magna Carta sails on a variety of itineraries and can also be chartered for a minimum of 6 passengers - please contact World Journeys for details.